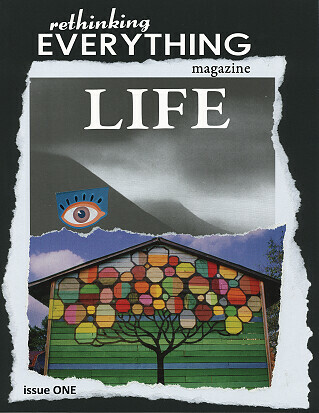 The very first issue of Rethinking Everything- LIFE is coming your way! Rethinking Everything Magazine, after two years of bold, edgy, exciting rethinking, has blossomed into Rethinking Everything Publishing – three separate and distinct publications. We are excited to offer them all absolutely FREE! and open your eyes… and your heart. Justin Wagner of OddballJuggling.com shares with us his journey from hard working, stressed out provider to joyful soul learning to play through life in Breaking the Cycle. Matt Kramer reveals his ground breaking theory of predatory leadership, the research behind it, solutions for a better world, and an opportunity for you… to help in his story, Obstacles on the Path to Utopia: The Price We Pay for Predatory Leadership. Heidemarie Schwermer lives entirely without money – every… single… joy filled day. She shares her evolution from exchanging money to exchanging energy and love in Living Without Money. Renee Anderson has a theory about the Woe Is Me Life – a life of worry, self pity, and riding the surface energies of life – since she’s moved through and found perspective. Her clarity could be your ticket to presence and joy. Have you shared us with your friends? Thank YOU! Let us know what you’re rethinking. We’d love to work with you.